The Soft-Ride Equine Comfort Boot is the horse health industry's premier system for hoof care needs of all breeds, sizes, and ages of horses. Constructed of high-performance synthetic materials and made in ten generous sizes, the boot slips on and off easily, and stays snug with sturdy Velcro straps. The tough outer shell gives the horse a rocker base of support while a removable, washable orthotic insert cushions and supports the bottom of the hoof. These are NOT designed as a riding boot. They are a therapy/comfort boot. 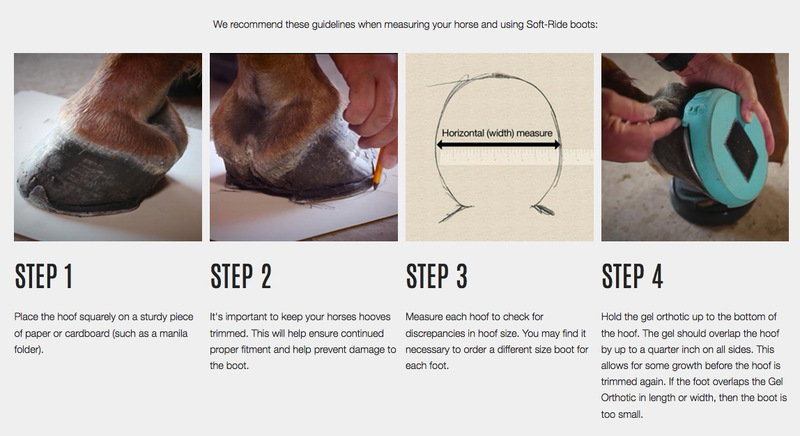 ** Please measure BOTH of your horse's hoofs before ordering the boots. Do not try and "guess" the boot size. Once you have measured according to the directions below - refer to the chart below for proper sizing. IMPORTANT: Measure your horse’s hooves shortly after they have been trimmed. This will help ensure that the boot is not too big. It’s important to keep your horses hooves trimmed. This will help ensure continued proper fitment and help prevent damage to the boot. Measure each hoof to check for discrepancies in hoof size. You may find it necessary to order a different size boot for each foot. **25% Re-stocking fee on all Soft-Ride returns. 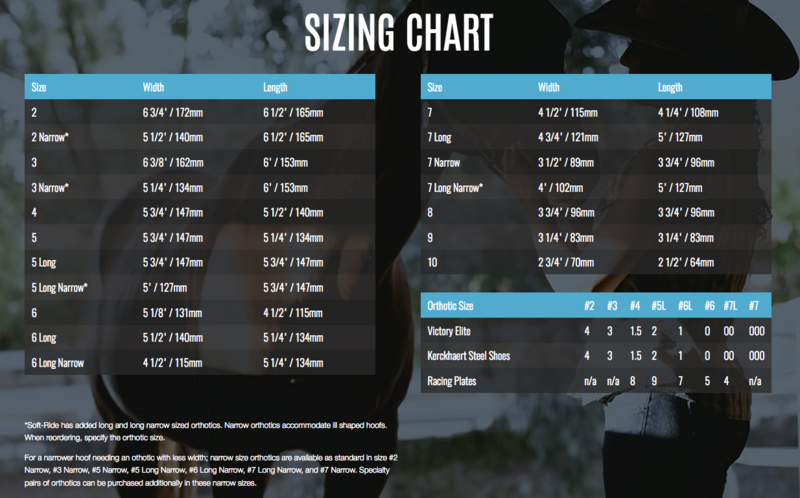 THERE ARE NO RETURNS OR EXCHANGES ON SOFT-RIDE BOOTS SIZES 2, 3, & 4. These are custom sizes and CANNOT BE RETURNED DUE TO SIZING ERRORS! Can you ride in Soft-Rides? These are NOT designed as a riding boot. They are a therapy/comfort boot. I need a right and a left boot, do I order two pairs? We now sell boots both individually and as pairs. However, we sell boots individually to replace a singularly worn out boot, or in the even that your horse has two different sized hoofs. Soft Ride states emphatically that all boots be used in pairs. Are there right and left boots? No, although we prefer that you put the same boot on the same foot, due to the impression that the hoof makes on the orthotic gel. Additionally, the closed cell foam molds to the horses pastern. As a frame of reference, we generally put the Soft-Ride logo to the outside of the hoof. Are there front and back boots? Soft Rides can be used interchangeably on all four feet. They are always sold in the same size pairs. I want the specialty orthotics in my boots, & I do not need the standard orthotics. Can I substitute the specialty for the standard orthotics? The boots are always shipped with the standard orthotics. After your horse is more stable, you may choose to use the standard orthotics for hauling, turn out, or standing on hard surfaces. You can not substitute the 'specialty' orthotics for the standard. Does my horse have to be barefoot or shod to use Soft-Rides? Either barefoot or shod, it does not matter. When do I measure for the boots? Most horses are on a 4-6 week trim cycle. There is approximately 1/4 " between the sizes. If your horse grows a LOT between trims, ( more then 1/4") then you may have an issue. Otherwise you should be able to measure at any point in the cycle and stay in the same size. Can I use bar shoes with the Soft Rides? Yes, you may need to have you farrier/vet cut a 'trough' in the frog support to accommodate the bar. Do I need to cut the orthotic to fit in the boot? Can I use medicine in the boot? Yes you can continue to medicate the horse hoof and use your Soft-Rides. Do you want the Soft Rides to fit loose or snug? You want the boots to fit snug. They can not be so tight that the foot is difficult to get in to the boot, but you can not have them to loose, or they will move around, which could result in rubs. There does NOT need to be a finger in between the boot and the hoof wall, you would like everything to be snug, without having a feeling of being too tight. Soft Rides should have good contact with the soles of the hoof, so that the gel can assist in increasing the blood flow. The entire BASE of the foot needs to be sitting on the orthotic gel. The bulbs can be past the base of the orthotic, but any part of the foot that is in contact with the ground, needs to be on the gel orthotic. Remember that there are very few feet that have a perfect fit. We get as close as we can. How should I clean Soft Rides? How do I thoroughly clean Soft Rides? First, I use the jet spray to remove all debris from the sole of the boot. In a five gallon bucket put half a capful of “Arm and Hammer Plus Oxi-Clean Stain Fighter”. I let them soak in the bucket for at least thirty minutes. I use a semi-stiff brush halfway through the process and brush up all surfaces to remove dirt. Once the soaking is over I spray them with water thoroughly to remove all soap residue and then leave them in the sun to dry. Virtually NO SMELL when I follow this process. How do I keep the boots from being so smelly? If you are leaving the boots on your horse 24-7 you need to take them off once a day clean out the feet AND the boots, then put them back on. You may also liberally sprinkle Gold Bond Baby Powder (79% Cornstarch, 4% Kaolin, a skin protectant and 15% Zinc Oxide, another skin protectant) on the sole, coronet band and bulbs of his hoof.